How does NH rank for energy costs? While the prices for both natural gas and electricity in New Hampshire are high, the actual monthly bills of the state’s residents are pretty close to average for the United States. That’s according to a recent study from WalletHub, which ranked the states by energy costs. The study looked at both energy rates and energy expenditures, comparing monthly bills to come up with a number for how much the average resident could expect to spend on electricity, home heating oil, natural gas and motor fuel. How does NH compare to other states? New Hampshire ranked 18th in the nation with an expected average monthly energy cost of $311. That’s despite the Granite State having some of the nation’s highest rates for electricity and natural gas. New Hampshire had slightly lower bills than most other New England states. Connecticut ranked second with an average monthly energy cost of $366. Maine came in 12th ($319), Massachusetts in 14th ($315), Vermont 24th ($307), and Rhode Island 29th ($302). Wyoming had the highest average monthly energy cost of $372. Washington, D.C. had the lowest average monthly energy cost, $203. High rates but lower bills? So how do high rates end up leading to average costs? That all comes down to consumption. Residents of New Hampshire use less electricity than in states like Florida and Mississippi, where homes are more likely to be air conditioned for much of the year. So even though the electricity rates are high, what people actually pay each month sits right in the middle nationally, with a ranking of 24th. New Hampshire also has one of the highest percentages in the nation of homes that use oil to stay warm, which could explain why average gas bills are lower here. 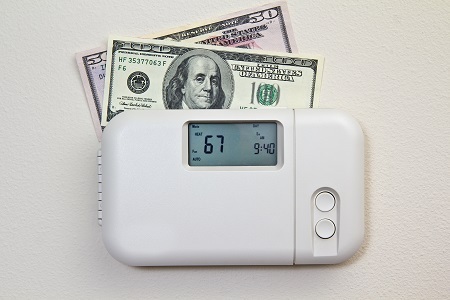 While the state ranked 47th for the average natural gas bill, it came in 2nd for the average monthly cost of home heating oil.